SCSK8 produces affordable skateboards and longboards aimed beginners. Many of these boards eschew graphics, leaving the bottom of the boards naked and saving money in the process. This SCSK8 longboard review will focus on those naked boards, as well as serve as the Heelside Chill SCSK8 trucks review. Interested riders also have the options of the SCSK8 skateboards, which are geared more toward street skating. But, for the longboarder, the following options should provide an overview of the SCSK8 longboard lineup. These boards all sit at the extreme low end of the market in terms of cost. However, that doesn’t mean you should necessarily purchase an SCSK8. The longboard market is rife with lower-cost boards like these. Does the SCSK8 warrant a look for a discerning beginner? Read on to find out. The SCSK8 pintails range in length from 34 inches to 44 inches, and in width from 8 inches to 10 inches. They are 7-ply hard rock maple laminate, and are a bright spot in these complete setups. None of these pintails come with graphics. Some riders complain of an abundance of flex, but flex is normal for these types of longboard. The SCSK8 drop down longboard options run from 36 to 41.25 inches in length, with a width of 9 inches. They are all 9 inches in width. Also 7-ply maple, these boards are all naked (no graphics), which helps keep costs down. These boards have a considerable drop toward the pavement near the trucks, which lowers the rider’s center of gravity and lends stability. One of the more attractive boards in the SCSK8 lineup, the bamboo series are attractive and functional. There are three styles — Pintail, Pintail Cut and Kick Tail. Like all bamboo-layered longboards, there will be a bit more flex than in all-maple construction. Are SCSK8 Trucks Any Good? The typical SCSK8 trucks come with a 7-inch, aluminum hanger and a 9.75-inch steel axle. They will not be confused for premium parts, but these trucks are solid. Some riders complain of speed wobbles, but proper adjustment usually fixes this issue. The stock bushings are overly hard, limiting the amount of adjustment you can achieve. With a longboard in this price range, some cost shaving is to be expected. The bushings will last as your skills develop, but you will want to replace them. The hardware on SCSK8 longboards is all standard size. It serves its purpose well, and should not require early replacement. The truck bolts are 1.5 inches long to accommodate the ½-inch riser pads. The Red series bearings installed are SCSK8 Abec-9 bearings. While this rating may be accurate, the product itself is not as well-built as some high-end-brand bearings, even those with lower ABEC ratings. They will roll well enough for the beginner, but will need eventual replacement. SCSK8 wheels are 70mm in height, with a 50mm contact patch. They have an 80a durometer, which is a middle-ground option between hard and soft. Like the bearings, they will be fast enough and function well while you learn to skate, but an upgrade is inevitable. Too many beginners pass up on boards like these because they feel the cost is too low. How could anything of quality cost so little, right? Well, keeping the boards naked goes a long way to reduce prices. Sure, some of the parts are more cheaply made than are the high-end brand parts on some other boards, but those parts are unnecessary when you are learning to keep your balance on the board. The people who ride these boards get that point. They are unconcerned with spectacular graphics on their boards (which no one will see if you’re actually skating). If you’re looking for speed, the SCSK8 drop down longboards should suit you. (They are available on Amazon.com here.) If you just want to cruise around, check out their pintails and the bamboo series. You could spend more on boards with graphics, like this. SCSK8 longboards are comparable in quality to boards costing as much as double their asking price. The bamboo models, are beautiful and functional and are a steal compared to boards like this Sector 9 G-Land Bamboo Pintail. Of course, you get what you pay for, but a beginner has little need for the speed one can reach on the higher-end longboards. If you have a deck, and are in need of the rest of the setup, the SCSK8 truck-and-wheel sets can get you rolling. The components (complete with bearings, hardware and riser pads) are not pro-board quality, but they will all suffice for new riders. Take Into Account The Positives and Negatives! The SCSK8 brand is not going to change the world. They produce affordable longboards for the beginning rider, and they do that well. The wood in the decks is real maple, and it is as solid as any beginner longboard on the market. Paying more for graphics and marketing is an option, but it’s one that will cost you. The downside to the SCSK8 longboard lineup should be taken with a grain of salt. Yes, the trucks are on the flimsy side and the bearings are slow. There is quite a bit of flex to the wood, also, and the grip tape and wheels won’t last for very long. However, when compared to other longboards of their ilk, the SCSK8 lineup is competitive. 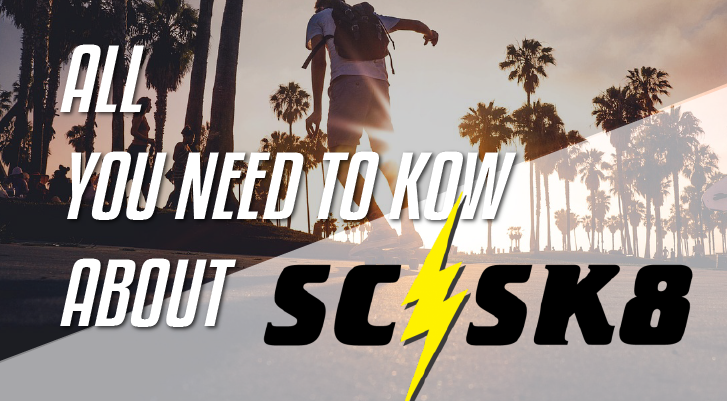 Final Thoughts – Should You Get An SCSK8 Longboard? The SCSK8 longboards are not top-tier rides, nor are they trying to be. The lack of graphics translates to a lack of pretension. When beginners throw down cash on knock-off longboards, it is obvious to everyone but them. There is nothing wrong with being a beginner, we all were at one point and no one should pretend otherwise. But there is something oddly universal in the beginner’s flushing of cash on cheap longboards when they could have purchased real quality for just a few dollars more. This lineup of longboards is a perfectly reasonable place to start. If the lack of graphics means you can afford to begin skating, then why would you hold out for a picture? In the final analysis, the SCSK8 brand is doing something right, and every beginner should consider their boards as a starting off point.